downtown condos are up +48% average; and +9% on a price per square foot basis. downtown coops are up +3% average; and +2% on a price per square foot basis. Here are two upcoming events that will help make Spring a bit greener for everyone. The upcoming Manhattan Electronics Recycling & Clothing Donation Event on April 22nd and Green Building Products: From Concept to Market, a free event for professionals about the principles of green product design, and strategies for designing and marketing green building products, on April 27th. I'm just back from two weeks in Tokyo and the jet lag is almost behind me now. I'm married to a Japanese woman (the beautiful and talented illustrator Coco Masuda) so this was a family visit, more so than a touring one. I tend to be such a 'dyed in the wool' native New Yorker, that it takes an immersive change of context, in a far away city, to reset my observation skills, and clear my overworked brain for creative refreshment. It was a welcome break. I had at least a couple of epiphanies about this site's context moving forward. The most striking difference between Tokyo and New York for me is the embedded culture of design over there. 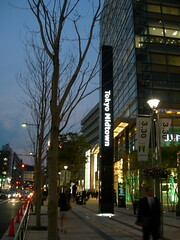 Whether building Tokyo Midtown, the new architectural centerpiece of the Roppongi district, creating MUJI's simple, functional goods, or the presentation of food from stores to plates, they intuitively respect and demand a high level of design in their lives. It has roots in traditional Japanese arts and crafts; and translates into good modernism quite naturally. The latter reflecting vividly their embrace of globalism and an economy which seemed to me to be visibly on the rebound after 16 years of stagnation. In fact, our relatives seemed to feel that Tokyo is poised for a run in real estate, as their economy heats up after a long period of correction. A recent article from Knowledge@Wharton seems to agree.